some good tech design info, that applies to any traditional American V8 engine. basic info but presented in a very understandable format. street heads, medium rpm racing heads, and high rpm racing heads presented at 3 distinct separate design parameters. ask yourself where the Pontiac street engine, and Pontiac SuperStock 400 racing engine fits in. the key to medium rpm racing engine design, is "wide open" induction system tuning with the overlap event, using the exhaust to pull the charge in. the key to street engine performance is maximum compression for the fuel octane used, and intake port flow- due to a muffled exhaust. To further explain the design of the 4V head it is helpful to understand the 351C 4V was designed for the criteria of the familiar racing motors of its era; i.e. racing motors having powerbands that peak at approximately 7000 rpm. High-rpm racing motors with powerbands peaking at 8000 rpm or higher were quite exotic in the late 1960s, this was not the design criteria of the 351C 4V. Modern high rpm racing motor intake system tuning theory utilizes wave propagation and gas inertia to create a pressure wave that pushes air and fuel into the cylinder at intake valve opening thereby increasing a race motors volumetric efficiency. But wave propagation tuning only starts to have meaningful effect at engine speeds in the range of 4500 rpm, air speed in the 2000 to 4000 rpm range is minimal and the wave action is of such small amplitude that no usable energy exists to adequately raise air density at intake valve opening. Increasing gas velocity at motor speeds below 4500 rpm (i.e. decreasing port cross-section) is tantamount to converting the ports into restrictions, and provides minimal results in return. Without high piston speed (resulting from high motor speed) the gas velocity needed to build high volumetric efficiency via wave propagation theory is not available. Since the portion of a motor's powerband that extends below 4500 rpm does not yield the expected improvements in volumetric efficiency when tuned using wave propagation techniques, it follows that as more of a motor's powerband lies below 4500 rpm the less relevant and beneficial wave propagation theory shall be in the design of the induction system. In practice modern tuning theory improves volumetric efficiency as expected in race engines having powerbands of 4000 to 8000 rpm or higher, below that powerband the benefits rapidly decline. The designers of mid-rpm race motors cannot rely upon gas inertia or wave amplitude tuning to increase volumetric efficiency; instead they rely upon a pressure gradient across the motor whereby low pressure in the exhaust system induces gas flow into the combustion chamber at intake valve opening. This requires larger valve area, larger cross section induction systems and valve overlap, all of which creates an unrestricted connection between the combustion chamber and the exhaust system, as well as an unrestricted connection between the combustion chamber and the intake manifold. The induction system must be "wide open" to raise the pressure in the intake manifold (i.e. less vacuum), and the exhaust system must be unrestricted and tuned well to lower the pressure there. At the end of the exhaust stroke, as the exhaust valve is closing and the piston is decelerating as it nears top dead center, the combustion chamber pressure will be equal to the exhaust system pressure. The intake valve begins opening during the valve overlap period allowing the higher pressure in the intake manifold to push fuel and air into the lower pressure zone of the combustion chamber. Narrow camshaft lobe centers increase valve overlap thereby giving this process the time it needs, and advanced camshaft timing opens the intake valve earlier thereby exposing more valve curtain area at maximum piston speed. It should be of no surprise therefore if a mid-rpm racing motor calls for larger, lower velocity intake ports than a high-rpm racing motor. This is not something you'll read in the Chevy-centric pages of Hot Rod magazine however. The parameters of a mid-rpm racing motor are the parameters which the 351C 4V cylinder head was designed around, and they are just as relevant for mid-rpm racing motors today as they were in 1970. 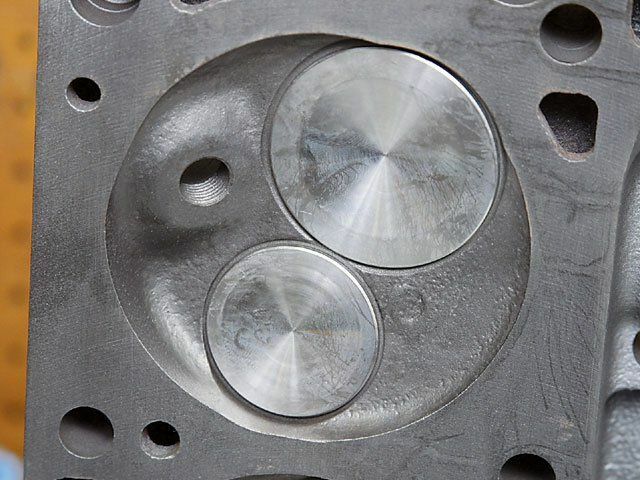 The engineering of the 351C 4V cylinder head is not obsolete, in most ways it represents widely accepted modern concepts for racing cylinder head design. These mid-rpm parameters are also the parameters of the Engine Master's Competition, where motors equipped with 351C cylinder heads do very well. Unlike either type of racing motor, high performance street motors exhaust into muffled exhaust systems and have powerbands peaking at approximately 6000 rpm. Street motors are generally equipped with smaller carburetors than racing motors, which reduces intake manifold pressure (higher vacuum). Street motors are generally equipped with muffled exhaust systems that increase exhaust system pressure, especially at high rpm. Under these conditions the pressure gradient across a street motor will not allow the exhaust system to reduce pressure in the combustion chamber low enough to induce intake gas flow when the intake valve opens. In fact, the same large valves that allow the 351C 4V racing motor to excel at pulling fresh intake charge into the cylinder during overlap will hurt the drivability of a 351C 4V street motor more than the average street motor during the overlap period. Overlap is more detrimental to a 351C 4V street motor than it is to street motors with smaller valves. It is important to keep the overlap event short in duration and to center the overlap event within the dwell period at top dead center. Street motors are not aided by overlap due to their exhaust systems, and they do not operate at high enough rpm to be aided by high velocity wave propagation tuning. There is nothing to help start the flow of air and fuel into the cylinder when the intake valve of a naturally aspirated street motor opens. For this reason a street motor can never have the same volumetric efficiency as a racing motor. To put it simply, naturally aspirated street motors make horsepower by compressing the air/fuel mixture as much as high octane pump gasoline will allow, and by allowing as much air as possible to flow into the cylinders during the shorter 270° to 290° intake duration period of a typical street camshaft. 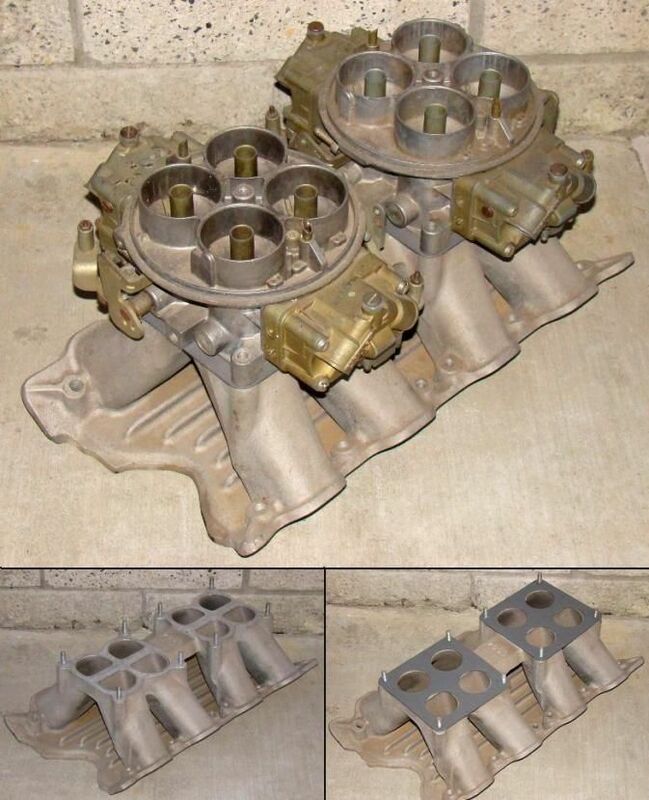 For the owners of small block Chevy and small block Ford powered vehicles this equates to purchasing aftermarket cylinder heads with better flowing ports. 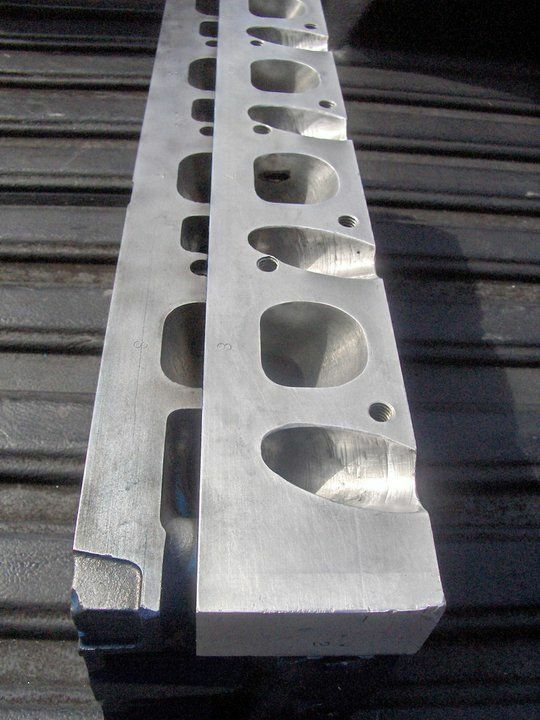 But the owner of a 351C 4V doesnt have to purchase aftermarket cylinder heads, the 2.9 square inch average cross-sectional area of the 351C 4V intake port is already sized in the ballpark to allow air to flow unrestricted into the cylinders. The intake ports of a modern high performance street motor are best optimized for camshafts which lift the valves 0.550" to 0.600", which is currently the range of the hottest 351C street cams. Lifting the valves this high off their seats pushes the limits of valve train wear verses horsepower potential. It is fortuitous that this range of valve lift is similar to the original design criteria of the 351C 4V. 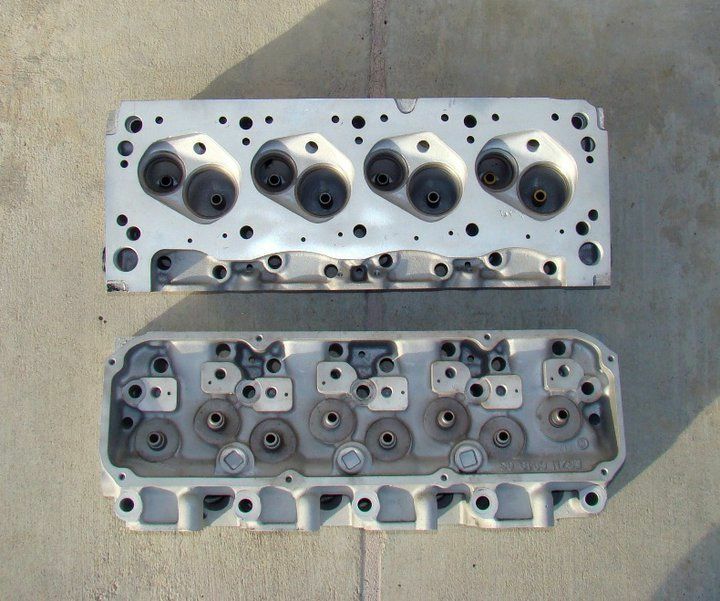 It is also worth repeating that the large valves of the 351C 4V cylinder head increase breathing area to and from the cylinder faster for a given rate of valve opening, and therefore the 351C 4V does not need the fastest rate camshaft lobes for good breathing like motors with smaller valves do. Is The 351C 4V Intake Port Too Big? It is a common criticism that the intake port of the 351C 4V cylinder head was too big, a lament of owners whose modified motors suffered from drivability and throttle response issues. Others observe the 4.3 square inch area of the intake port entrance and assume automatically that it is too large. But that large port entrance is deceiving, the average cross sectional area of the iron 4V intake port is only 2.9 square inches. For any given gas flow rate, the velocity of the gas is determined by the cross-sectional area of the port it is flowing through. The gas velocity will be higher through a port with a smaller cross-sectional area, or the gas velocity will be lower through a port with a larger cross-sectional area. Enthusiasts are often reminded by the Chevy-centric popular press that it is possible for the cross-sectional area of a port to be so large, the gas velocity so slow, that a motors low rpm performance is impaired. But what is seldom acknowledged is that it is equally possible for the cross-sectional area of a port to be small enough that the port acts as a restriction to gas flow at higher engine speeds. Just as it is possible for gas velocity to be too low, it is also possible for gas velocity to be too high. When gas velocity is too high the gas acquires a mind of its own, it doesn't want to follow the port around the turn into the valve pocket and distribute evenly around the backside of the intake valve as it flows into the cylinder; high gas velocity can lead to fuel separation from the air due to centrifugal force; and somewhere above half the speed of sound gas velocity will start working against itself. The intake port cross-sectional area of a racing cylinder head with the dual purpose high performance street motor aspirations of the 351C 4V had to walk a fine line; (1) the gas velocity needed to be high enough to keep the fuel in suspension at engine speeds which are lower than the engine speeds encountered by a racing motor, (2) the gas velocity at low engine speeds had to be high enough for good throttle response, and (3) the gas velocity at low engine speeds had to be high enough to promote good air flow rates at low intake valve lift. On the other hand (4) the intake port cross-sectional area also had to be large enough so as not to limit horsepower at high rpm or to limit the motor's ability to pull to an unprecedented high rpm limit for a street motor, in the range of 7000 rpm. To achieve this lofty goal the 351C 4V designers shaped the ports and sized the valves to create a cylinder head that operated over an unprecedented wide power band, a power band having a width of about 6000 rpm. They then tailored the cross-sectional area of the intake port to position that power band to operate from idle to 7000 rpm in conjunction with a 351 cubic inch motor. The average cross-sectional area of the 351C 4V intake port was not accidental nor the product of bigger is better mentality, it was sized very specifically to achieve the power band of the 351C 4V. Was the 351C 4V cylinder head successful as the cylinder head of a street motor? People will argue this point forever. Off the show room floor, as delivered from Ford, the 351C 4V motor did not have drivability or throttle response issues. With the Cobra Jet camshaft and 750 cfm Autolite carburetor it was a very hot performer with typical production motor drivability. Let’s not forget the 1969 and 1970 Boss 302 Mustangs, which combined the 4V Cleveland cylinder head with a 302 cubic inch short block. This performance motor was equipped with a 780 cfm Holley carburetor and a camshaft with 290° intake duration and 58° of valve overlap. The drivetrain consisted of a 4 speed manual transmission and moderate 3.50:1 rear axle gears. Yet even this hot performer possessed typical production motor drivability. Ford literature from 1970 described the 351C 4V intake port as carefully sized and indeed it was. The performance of the 4V cylinder head gracefully walked a line between street performance and racing performance, between operation at low engine speeds and operation at high engine speeds, between air flow at low valve lift and air flow at high valve lift. The 351C 4V walked such a narrow line between race engine and street engine that the usual aftermarket performance modifications applied to small block Chevys and small block Fords adversely impacted the drivability of the 351C. Owners and aftermarket parts manufacturers simply failed to acknowledge or understand the unusual nature of the motor they were modifying. The in-line valve motors people are more familiar with have small ports and small valves for the given displacement of the motor, thus pushing the motor’s power band into the very lower end of the rpm range. Such motors rely upon camshaft and intake manifold designs to widen the power band and promote mid and upper rpm power. The 351C 4V is just the opposite, the intake port and valves were sized to give the motor response to 7000 rpm, the 351C 4V relies upon the camshaft and intake manifold design for its lower rpm performance. One strategy for modifying the 351C 4V for higher output street operation is to pay attention to the parameters set by Ford, and to avoid straying too far from those parameters. Camshaft event timing, intake event duration, valve overlap, intake manifold design, carburetor tuning and ignition tuning are critical to drivability. Compression ratio, combustion chamber design, gearing and torque converter stall speed also contribute to the drivability of a 351C 4V. 20 different revisions based on racing experience, before they finalized the design. this is how you design a cylinder head. I have a 400M in an F150 w/4 speed and that old truck never fails to impress me. kept it all these years just because the engine is so damned cool. most don't realize how much effort went into designing the 351c/351m/400 family. The result of an aggressive design program, the 335 series motors were capable of making more horsepower per cubic inch, naturally aspirated, using gasoline fuel, than any other mass produced OHV motor ever made. It represents the culmination of all the motor savvy Ford engineering had accumulated during the Total Performance era. Every way in which the 335 series motor design deviates from the design of the Fairlane/Windsor motor was a purposeful change made to accomplish a specific goal. Amongst the goals of the 335 series was (1) to make the motors easier to manufacture, (2) to make the motors less expensive to manufacture, (3) to make the motors more durable, (4) to improve the quality of the motors, (5) to reduce the weight of the motors or (6) to make more horsepower. Ford took advantage of the most modern advancements in engineering, test apparatus, tooling and manufacturing equipment during the design, testing and manufacture of the 335 series motor. Bill Gay's advanced engine engineering team applied everything Ford had learned in building engines for Indianapolis racing, LeMans racing, NASCAR racing, drag racing, road racing, Baja racing and rally racing in the design phase of the 335 series. To avoid the expense of re-engineering and re-tooling a passenger car motor for racing, the 335 series motor was designed to be race ready from its inception, and then detuned for production car applications. The motor had to avoid the use of what Ford considered extravagant parts so that it would be inexpensive to manufacture, making it suitable for mass production. Another goal was to simplify the inventory of 335 series motor components, keeping the inventory as small as possible, which mandated a greater commonality of parts across the entire series, and limited the use of separate specialized performance castings or parts. As a result of this all 335 series motors have equally robust, race ready castings. Improvements are found throughout the motor, but performance enthusiasts recognize the cylinder head as the component which sets the 335 series most apart from other motors. The Cleveland cylinder head design is best described as having a shallow poly-angle combustion chamber and valves canted both longitudinally and transversely. The design approaches the port configuration, combustion chamber configuration and performance of a hemi head without the expense of a hemi head. Ford testing in the early 1960s found the poly-angle combustion chamber and canted valves of this type of cylinder head yielded broad - flat torque curves; compared to other cylinder head designs it did not produce the highest peak power but it produced the best average torque and horsepower over the widest range of engine speeds. This cylinder head configuration was chosen specifically for its ability to operate over a wide powerband and as I shall explain later the 335 series engineers took maximum advantage of this characteristic and stretched it to its limits. To an engine designer the combustion chamber is possibly the most important aspect in the design of a cylinder head. The best designed intake and exhaust ports in the world cannot produce superior torque and horsepower if they are supplying fuel and air to a cylinder with a poor or average combustion chamber. The 351C had the highest horsepower to displacement ratio of any mass produced push-rod (OHV) V8 not solely because it had well designed ports and large valves providing superior volumetric efficiency, but also because it had superior thermal efficiency provided by one of the best performing combustion chambers of any mass produced OHV (push-rod) V8. The small inclined angles of the valves enabled the engineers to design a very shallow combustion chamber which promotes good turbulence within the combustion chamber. The turbulence promotes good mixing of the air and fuel, and prevents the formation of pockets of stagnant air and fuel. The final result is high thermal efficiency and high resistance to detonation. This description applies to both the open chamber and quench chamber versions of the combustion chamber. The quench combustion chamber was designed to reduce combustion chamber volume and increase the compression ratio; the quench combustion chamber is not more resistant to detonation nor does it improve thermal efficiency. The small size of the quench areas prevents any fuel-air mixture from being shielded from the flame front. Flat - shallow chambers create turbulence evenly throughout the chamber, and direct (and reflect) the energy of the flame front better. The combustion chamber being open (open chamber heads) or centered over the piston dome (quench chamber heads) means the expanding flame front pushes downward much more centrally, at a better angle (perpendicular), more completely and evenly over the entire piston dome; approaching the ideal combustion chamber performance of a two-stroke motorcycle engine. The experience and knowledge acquired during air flow studies for Fords Indianapolis and LeMans racing engines was utilized in the design of the cylinder head and intake manifold ports. The port contours were refined to produce high flow low restriction runners. An abrupt ramp cast into the floor of the intake port directs the air fuel mixture to the roof of the port near the entrance to the valve pocket resulting in an appreciable increase in air flow (quoting Ford). The intake port turns gently left to enter the valve pocket and sets the air fuel mixture swirling to flow evenly around the back-side of the intake valve head as it flows into the cylinder. The big 4V valves increase breathing area to and from the cylinder faster for a given rate of valve opening (instead of a smaller valve opened at a higher rate of acceleration which is more stressful for the valve train). Larger valves also allow the motor to develop power over the widest rpm range, and they allow the ports to flow well at low, mid, and high valve lift. Although it is not well understood throughout the hot-rod industry, large valve area increases the overlap area, as I shall explain later this is good for a racing motor, but the drivability of a street motor will be more upset by tight camshaft lobe separation angles. Please note: 351C 4V street motors need camshafts with wider lobe separation angles. Although people do not think of the 4V version of the 335 series cylinder head as a raised port racing head that is exactly what it was. The intake port roof was about 1/2" higher than the intake port of the 2V head; it was raised to provide optimum flow with intake valve lift up to 0.580" which was typical of endurance racing camshafts in that era. The port air flow was enough to make more than 500 horsepower with typical endurance racing camshafts in 1970, and eventually supported naturally aspirated Pro-Stock drag racing engines to 10,000 RPM and 750 horsepower. It is an amazing feat that a cylinder head with this type of potential was ever installed on a mid-size (351 cubic inch) street motor. the 2v heads have similar flow numbers to a stock D-port at max lift, but the Cleveland heads blow away a D-port in the .100"-.300" lift range, and the combustion chamber is far better than a D-port head. these heads were on a 351/400 CID engine. the port and chamber design could easily handle a 450-460 CID street engine . For how good a 400/428/455 Pontiac ran with D-ports, the Pontiac heads paled in comparison to what Ford was offering at the time, from the design standpoint. the stock unported 351C 4V intake port flowed 290 cfm, as-cast. 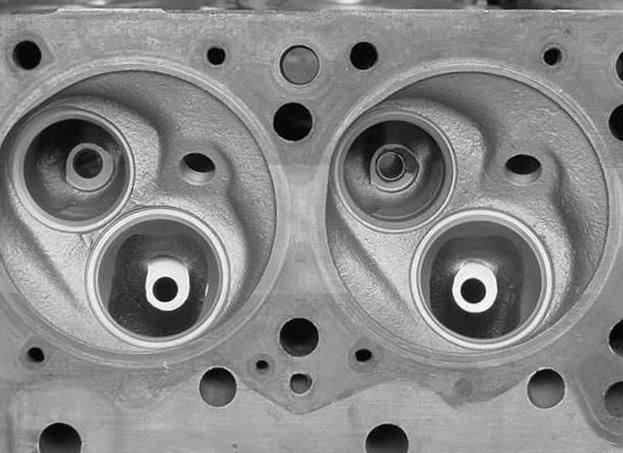 There are two ways in which Cleveland cylinder heads differ from one another: the combustion chamber volume and the port cross-sectional area. The combustion chambers are either the "open" style or the "quench" style. The quench style chamber encloses the valves more tightly in order to reduce the volume of the combustion chamber. There is no power advantage in using the quench combustion chambers over the open combustion chambers, both combustion chambers have the same thermal efficiency, and both combustion chambers are equally resistant to detonation as well. The two practical advantages of a quench combustion chamber are (1) low rpm turbulence improves low rpm torque, giving a street motor a small degree better response to the throttle and (2) less machine shop work is required to achieve compression ratios in the range of 9.5:1 to 11.0:1 with flat top pistons. The small port 2V (i.e. 2 barrel carburetor) cylinder head and the large port 4V (i.e. 4 barrel carburetor) cylinder head were both cast by Ford with both types of combustion chamber. A 351 cubic inch motor with flat top pistons will achieve 10:1 compression ratio with quench chamber heads having 63cc combustion chambers and standard 0.035" deck clearance. However 10:1 compression ratio can also be achieved with open chamber heads having 70cc combustion chambers (milled) and zero deck clearance. Cleveland heads can be milled up to 0.060"; the combustion chamber volume of quench chamber heads is reduced 1cc for every 0.006" milled, and the combustion chamber volume of open chamber heads is reduced the same amount for every 0.005" milled. The most familiar 2V heads with quench combustion chambers were cast by Ford of Australia for their 302 cubic inch 302C. Since these heads were cast for a 302 cubic inch motor they have 58cc nominal combustion chamber volume. Using these heads on a 351C with standard deck clearance will raise the static compression to 10.5:1. This is a little too much static compression for a typical street engine project, so unless your engine project calls for 10.5:1 or more static compression I don't recommend using the quench chamber Australian heads. However, US Ford also sold a cast iron quench chamber 2V head over-the-counter in the 1980s via the SVO parts program. The part number of the head was M-6049-C351, this head was cast specifically for 351 cubic inch motors, its combustion chamber volume was 62cc, as opposed to the 58cc combustion chambers of the similar heads from Australia. 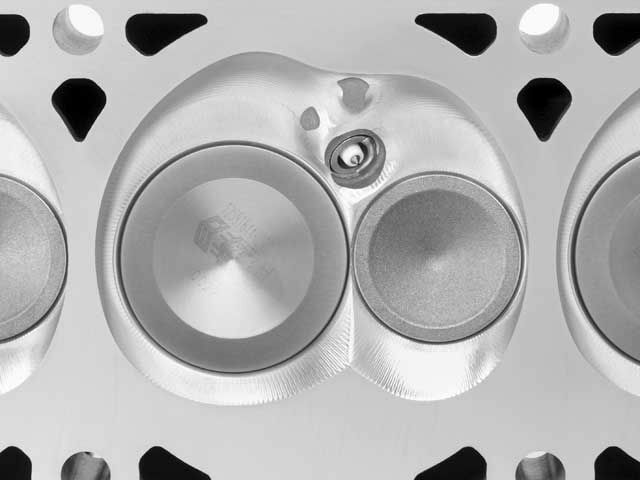 The SVO heads are difficult to locate today and are often confused with the Australian 302C heads. The thermal efficiency of a combustion chamber is only half the story of a cylinder head however; the other half of the story is the ability of the ports to fill the cylinders with air (aka the volumetric efficiency). 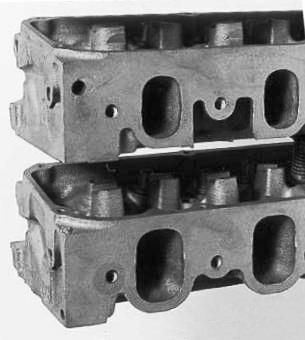 The Cleveland cylinder heads were cast with either small cross-section, standard height 2V ports or larger cross-section, raised height 4V ports. The air flow rate of the 2V intake port is superior to the air flow rate of the 4V intake port at low valve lift (0.100" to 0.300"), while the air flow capability of the 4V intake port leaps ahead of the 2V intake port at 0.400" valve lift. The iron 2V intake port has some real maximum air flow limitations compared to the iron 4V intake port. Unported the 2V intake port air flow rate hits a brick wall by 0.400" lift, and even with porting the air flow rate is maxed-out by 0.550" lift. Whether comparing ported or unported heads, the 2V intake port's flow rate is 75 cfm less than the flow rate of a 4V intake port at 0.600" valve lift. The 2V cylinder head actually fills the cylinder more quickly with air than a 4V cylinder head up to 0.300" valve lift, it is only above 0.400" valve lift that the 4V cylinder head begins to fill the cylinder with air more quickly than a 2V cylinder head. Street camshafts having maximum valve lift in the range of 0.500" to 0.550" do not hold the intake valve open above 0.400" lift long enough to take good advantage of the 4V cylinder heads superior air flow capabilities. This is why a 2V street motor with ported 2V heads will give a 4V street motor a run for its money up to about 6000 rpm. The small cross-section of the 2V intake port takes its toll at high rpm however; a 2V motor does not have the high rpm pull that a 4V motor does. There are two practical differences between motors built with 2V heads and motors built with 4V heads one must consider in deciding which type of cylinder head to use; (1) differences in power characteristic between the two motors and (2) differences in gearing required by the two motors. Some street performance and sports car enthusiasts prefer the stronger low rpm power characteristic and throttle response of the smaller cross-section 2V ports, while others prefer the 3000 rpm kick and endless high rpm pull of the larger cross-section 4V ports. Compared to a 2V motor a 4V motor pulls off the line a little softer and builds more "steam" with engine speed. I call the 4V motor's power characteristic the "charging Rhino". The 2V motor is a better choice than the 4V motor for low rpm torque applications such as towing and hauling vehicles, off-road and rock crawling vehicles and heavy vehicles in general. Due to this difference in power characteristic 4V motors require lower gearing for better "mechanical advantage" at low engine speeds and to operate the motor better within its powerband which is at generally higher engine speeds. Since 2V motors do not require as low gearing as 4V motors they will potentially cruise at a more comfortable (lower) engine speed and return better fuel economy. Newer 5 and 6 speed transmissions however can provide both low gearing for acceleration and high gearing for cruising and fuel economy; the 4V motor is at less of a disadvantage in regards to "cruise" engine speed and fuel economy when used in conjunction with a 5 or 6 speed transmission. Conversely, in that regard the 2V motor is at more of an advantage with 2, 3 or 4 speed transmissions. Last edited by Zedo : 06-17-15 at 08:41AM. induction, exhaust, and why filling intake ports, and high porting exhaust, are patchwork fixed. the high port exhaust plates, cause the head to crack and leak. filling the intake floor, disrupts the design. imagine having a stock GM Pontiac cylinder head, you can launch at 8000 rpm. the only reason they filled the floors of the intake ports, was to match it to later modern intakes. they were NOT filled to improve throttle response or gain velocity ! the port would then be enlarged further inside the port, to restore the port volume that was removed due to the floor filler. Intake manifolds and cylinder head intake ports do not operate independently of one another, they work in conjunction with one another to form an induction system. Although the average cross sectional area of the iron 4V intake port is 2.9 square inches, the cross sectional area of the port entrance flares open to 4.3 square inches. It was designed to mate with intake manifolds that adhered to Ford's "wide open induction system" philosophy of the late 1960s. The wide open induction system concepts included long - equal length - large cross-section manifold runners, alignment of carburetor venturis above the entrance to manifold runners (for better fuel distribution) and independent runner induction systems. Tunnel Rams (i.e. long runners standing up), Cross Bosses and Bud Moore Boxes (i.e. long runners lying down) were manifolds conceived in this time period. Alignment of the carburetor venturis with the entrance to the intake manifold runners was the reason for the creation of the Autolite in-line carburetors, which were developed side by side with the Cleveland engine. The Holley 4500 Dominator series carburetors were also developed in this period. 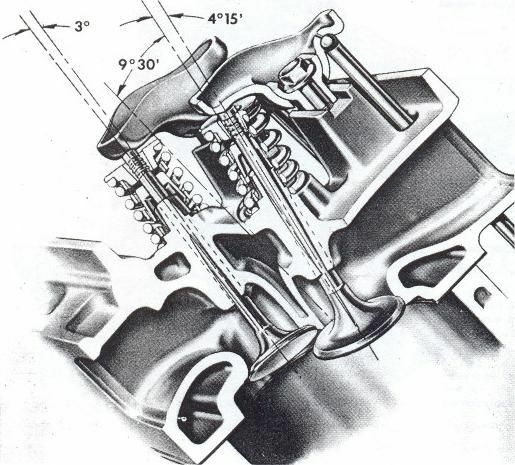 The Dominator carburetors featured wider venturi bore spacing, larger diameter butterflies, and increased air flow capacity; all of these aspects were required by tunnel ram manifolds and independent runner induction. The cross-sectional area of the 2-1/4" butterflies of the large Autolite in-line carburetor, #D0ZX-9510-B, is 3.97 square inches. This carburetor, as well as the Holley list 6214 Dominator carburetor, were designed directly or indirectly by Ford engineering for independent runner induction systems. Both carburetors were also designed at the same time as the 335 series motors. The 4.3 square inch intake port entrance of the 351C 4V head works very well with independent runner induction. The throttle response is awesome, the drivability is very good, the powerband is very wide and the volumetric efficiency improves dramatically. There is nothing about the power delivery to give anyone the impression the ports are too large. It is obvious the 351C 4V is "in its element" when equipped with independent runner induction. The Shelby/Blue Thunder intake manifold was designed by the same engineering group that designed the 4V cylinder head. The large volume runners of that manifold are designed to complement the "wide open induction system" philosophy of the 4V intake port. Intake manifolds and cylinder heads that are engineered by the same designer to work together and adhere to the same induction system philosophy usually make the best combinations. This is why the Shelby/Blue Thunder intake manifold works so well with the 4V cylinder heads. Intake manifolds with long - equal length - large cross-section runners and high volume plenums fell out of favor decades ago. 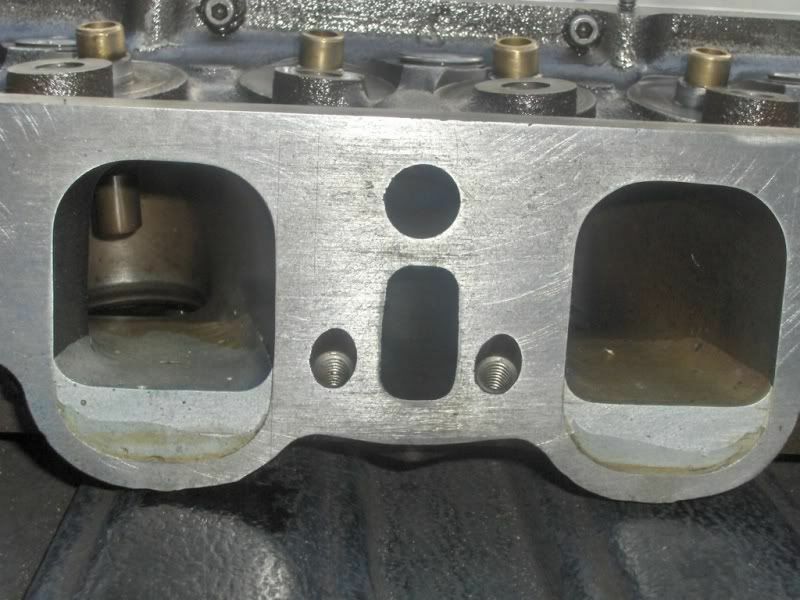 The large cross-sectional area of the 4V intake port entrance does not integrate well with modern intake manifold designs. However the average cross-sectional area of the 4V intake port is very well sized, it walks that "fine line" I mentioned previously. There is a relationship between port cross-sectional area, port gas velocity and air flow rate. 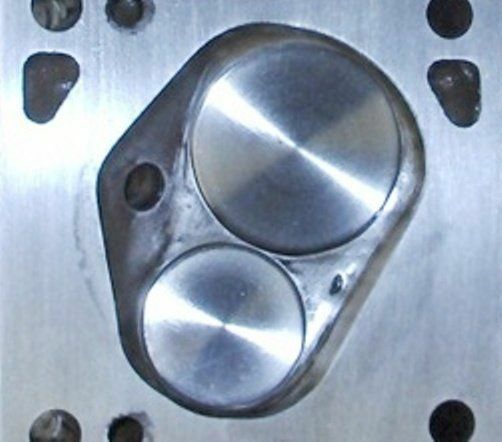 The entrance of the 351C 4V intake port is at a fixed height in relation to the deck, and the intake valve is at a fixed angle in relation to the port. These two parameters dictate the angle the port turns to direct airflow towards the intake valve. Given these constraints, the port must have a certain average cross-sectional area in order to flow air at a certain rate of CFM. If the port cross-section is altered the flow capability of the port shall be altered and the velocity of the fuel/air mixture shall be altered. If the average intake port cross-sectional area is enlarged the air flow rate at high intake valve lift improves, but the air flow rate at low intake valve lift will suffer, port gas velocity will decrease and motor performance at low rpm will likewise suffer. If the average port cross-sectional area is decreased the air flow rate at high valve lift will also decrease, but the air flow rate at low intake valve lift will improve, port gas velocity will increase and motor performance at low rpm will likewise improve. Engine builders and racers have been stuffing the entrance to the 4V intake port since the 1970s. When a 4V intake port is stuffed to work in conjunction with an intake manifold having smaller cross-section runners, the port's average cross-sectional area is reduced with a corresponding reduction in air flow at high intake valve lift. It is important to realize that there is no problem with port velocity with 351C 4V racing motors having a powerband that starts at 4000 rpm or higher. Ports were not stuffed to increase gas velocity or to improve low rpm throttle response ... some of these motors were leaving the starting line at 8000 rpm! Ports were stuffed to match them with the runners of custom intake manifolds. Intake manifold design was rapidly changing in this period, and each engine builder and racing team had their own secret designs. It is also important to realize no racing team would accept the decrease in high valve lift air flow that accompanies stuffing the entrance to the 4V intake port (thereby reducing the average cross-sectional area of the intake port). To restore air flow at high intake valve lift the average port cross-sectional area was restored by grinding the port cross-section larger deeper within the port, something you would never notice unless it is pointed out to you. A modern over-the-counter single plane intake manifold designed for stuffed 4V ports is the Funnel Web manifold sold by Terry Parker of Australia, Mr Parker also sells port stuffers that compliment his manifold. A single plane manifold such as the Funnel Web manifold will be in its element used in conjunction with a racing motor, operating at high rpm, utilizing a high lift camshaft. The reduction of intake port air flow at high valve lift resulting from the use of port stuffers does not compliment this application however. In this application I recommend having the engine builder work with a head porter to open up the intake port beyond the port entrance and regain the high valve lift air flow lost by installation of the port stuffers. Modest reduction of the average 4V intake port cross-sectional area does offer some possible advantages for a street motor; although the air flow rate at high valve lift is diminished the air flow rate at low intake valve lift will improve, port gas velocity will increase and motor performance at low rpm will likewise improve. Modest reduction of average port cross-sectional area gently nudges the 4V port away from that fine line it walks between street performance and racing performance in the direction of street performance. However if the reduction of a 4V intake port's average cross-sectional area is carried too far the motor's willingness to run at high rpm will suffer. I estimate the new average cross-sectional area of a 351C 4V intake port with the floor of the entrance modestly filled 1/2" shall be 2.6 to 2.7 square inches (a 7% to 10% reduction in average cross sectional area). This approximately 15cc reduction in port volume will increase port gas velocity about the same as stroking the motor to 377 cubic inches, and shift the powerband of the motor about 400 rpm lower. Most enthusuasts who feel the 351C 4V is a little "soft" in the lower rpm range find stroking the motor to 377 cubic inches is all it takes to wake up the motor's low rpm power; I'm sure modestly filling the port as I've described would yield similar results. A 1/2" fill will match the 4V intake port height with the runner height of Scott Cook's second generation dual plane intake manifold for stuffed 4V ports, and the combination of stuffed intake port and Scott Cook's manifold would modernize the 351C 4V induction system for the street. Even though the 351C 4V intake port's average cross-sectional area is well proportioned, it is erroneously criticized for its size; yet the exhaust port is never criticized when in reality it has always been the port which requires the most reworking. The 351C 4V exhaust port is enigmatic. It is not as race ready as the intake port; it requires much more effort to prepare for racing by a head porter than the intake port does, it does not appear to be as well thought out as the intake port. The design is rumored to have been compromised by the need for the exhaust system to hug the motor closely and avoid any clearance issues with the high shock towers found in Ford's Mustangs, Falcons and other compact car chassis. It is hard to fathom why Ford would design a racing head with a well proportioned intake port and an excellent combustion chamber and then encumber that design with a poor exhaust port. If the port had been raised a seemingly insignificant 1/4" higher it would have functioned much better. The flat roof of the exhaust port was designed to bounce exhaust gases, but apparently that idea didnt work out, for by December 1972 Ford's contractors Bud Moore Engineering and Gapp & Roush were selling 351C 4V heads with drastically modified exhaust ports known as high port cylinder heads. The high port heads were modified by removing the exhaust side of the head casting with a milling machine and installing an exhaust port plate in place of the portion of the head casting that had been removed. The exhaust port plate raised the outlet of the exhaust port, thereby reducing the angle of the port in relation to the valve pocket. The raised exhaust port was worth at least 20 bhp at 8000 rpm according to Ford. If you are wondering if this is a worthwhile modification for a street car, the answer is an emphatic no. High port heads eventually crack, they constantly develop exhaust leaks and there are no off-the-shelf headers available for such heads. Other race engine builders attained similar results by filling the lower portion of the exhaust port by brazing and afterward grinding the port for a rectangular shape with a cross sectional area of about 1.9 square inches. If you feel compelled to raise or fill the exhaust port the brazing method is obviously a much more reliable route for doing so. Although the port match is not ideal, off the shelf 4V headers will bolt up to a cylinder head thus modified. Most enthusiasts, racers and engine builders make due with extensive grinding of the 4V exhaust port. Porting the 351C 4V exhaust port entails opening up the valve pocket to center it around the valve guide, reducing the OD of the valve guide, blending the walls and roof of the valve pocket with a 1/8" radius, three angle grinding of the valve seats, unshrouding the exhaust valve in the combustion chamber, straightening the exhaust port walls between the valve pocket and the port exit, rounding (and removing the bump) of the exhaust port roof, raising the exhaust port roof as much as possible and increasing the radius of the short turn between the valve pocket and the port floor. To study a bare 351C 4V cylinder head casting in the 1970s was like studying a textbook on state-of-the-art racing motor cylinder head design. Peering at the carefully designed and cast port contours and the unusual combustion chamber you knew you were observing something very special. We had great admiration for the engineering that went into the head's design. I still feel that way today. The 351C 4V cylinder head was capable of serving as the foundation for a street motor that operated from idle to 7000 rpm with good drivability, it was capable of serving as the foundation for a NASCAR motor that cruised the super speedways at 8500 rpm and it was capable of serving as the foundation for a Pro Stock drag racing motor that revved to 10,000 rpm while making 750 horsepower. A cylinder head having these capabilities was unprecedented at the time it was manufactured. The fact these capabilities were incorporated into an inexpensive, mass produced cylinder head is mind-blowing. The cylinder head was proven to be versatile and capable of operating over a very wide powerband. The design is a credit to the engineers who designed it, and it stands as a witness that the expertise they gained during Fords Total Performance Era was more than just advertising copy. When Ford introduced its first aluminum small block racing heads circa 1982, known as the SVO heads, the ports were highly modified from the original 4V design. This should be no surprise to anybody who has read this story; racing motors were operating at much higher engine speeds and were capable of taking advantage of gas inertia to increase volumetric efficiency, camshafts were lifting the valves much higher off their seats, and intake manifold design had drastically changed. But the combustion chambers of the aluminum SVO heads were identical to the quench combustion chambers of the iron heads. A dozen years had passed since the 351C 4V had been put into production yet neither the engineers nor the racing teams had any ideas for improving the combustion chamber. Perhaps those who have taken the 351 Cleveland combustion chamber for granted will gain new respect for what has always been the best part of the cylinder head's design. The 351C became the first modern OHV racing motor due to the many new concepts incorporated into the cylinder head design. The poly-angle 351C 4V cylinder head became the foundation for racing head design for decades to come; the intake port incorporates concepts that are in wide use today, it has been copied by every manufacturer competing in series utilizing OHV motors. Today's OHV race motor cylinder heads with their small valve angles, high ports and shallow - poly angle - high swirl combustion chambers are refinements of the 351C cylinder head design. just in case you glossed over and missed it, here it is again, from the OP. do you still think intake port volume "doesn't matter" ?? modern Chevy LS chamber. is it new ? no. it's copied from a 50's Chrysler and 70's Cleveland. and slightly improved. creating turbulence, but not for preventing detonation. Last edited by Zedo : 06-17-15 at 10:26AM. I had 5 of these Chrysler early poly engines at one time...sold them all back in 2009 when the economy got bad. they were 331 Chryslers and 325 Dodges should have kept a few.this was the original design that Ford and Chevy copied- leave it to Chrysler, they were about 20 years ahead in combustion chamber design back in the 50's. combustion chamber of a mid-1950's Chrysler Poly Spherical canted valve head. Ford don't resemble this too much, but the Cleveland is a dead ringer. surface of the piston dome. closed chamber i.e. quench head Cleveland. I had a set of these heads too. sold them. should have kept them. upon the center of the piston dome.